I consider myself a fairly orgainized person nestled equidistant somewhere between Hoarders, Burried Alive and the husband from the movie Sleeping With The Enemy (although I do sometimes face all may canned goods out, lined up perfectly.....and level off the lenghth of my hand towels on the towel rack. (Sometimes.)). So I was intrigued by the notion of compiling a shopping list of all my online food finds. Ziplist is a free online recipe and shopping app/website used to compile recipes and ingredients. 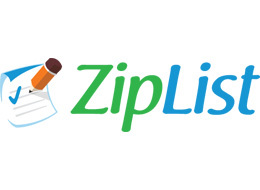 You can install a Ziplist Recipe Clipper onto your bookmarks toolbar, create an account, and you're good to go. Now when you are searching online for a recipe, you just click on the clipper and it saves the recipe in your recipe box. When your ready to go shopping choose the recipes you want to try and add them to your list. An itemized shopping list is generated. Depending on where you are located, it even syncs to your local grocery store, arranging your list by their aisle allocations. O.M.G. If it only did laundry....(sigh). P.S. I was in no way compensated by ziplist for this post. I'm not against it, FYI Ziplist....just sayin'.